Dr. Salameh has been an Assistant Professor in the Computer Science and Engineering Department. Prior to joining AURAK, she worked as a postdoctoral researcher in computer science at the Computer Science Department of the University of Pau & Pays de l’Adour. Her teaching interests include design and software programing, software engineering, web programing, human-computer interaction, and machine learning. 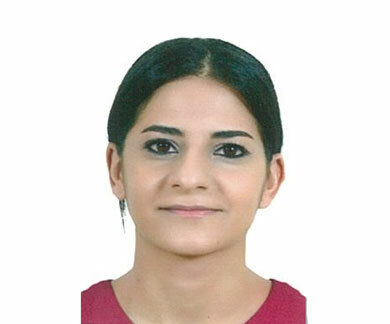 In July 2017, Dr. Khouloud Salameh received an international Ph.D. in Computer Science from the University of Pau & Pays de l’Adour and in Control Engineering, Automation and Robotics from the University of the Basque Country in Spain. She earned her M.Sc. of Engineering (ME) in Computers and Telecommunications from Antonine University, Lebanon in 2013. Her research interests include digital ecosystems, optimization techniques, cyber-physical system modelling (Smart Grids, Microgrids, etc. ), and semantic image retrieval. Khouloud Salameh, Richard Chbeir, and Haritza Camblong. “Multi-objective cooperative scheduling: An application on smart grids.” Applied Computing and Informatics (2017). Khouloud Salameh, Richard Chbeir, Haritza Camblong, Ionel Vechiu, A Digital Ecosystem Cooperative Model: An Application on Microgrids. IEEE Transactions on Sustainable Computing. 2017. Khouloud Salameh, Richard Chbeir, Haritza Camblong, Ionel Vechiu, Microgrid Components Clustering in a Digital Ecosystem Cooperative Framework. Procedia Computer Science. 2017 Jan 1; 112:167-76. Khouloud Salameh, Richard Chbeir, Haritza Camblong, Multi- objective Cooperative Scheduling for Smart Grids. InOTM Confederated International Conferences” On the Move to Meaningful Internet Systems” 2017 Sep 23 (pp. 543-551). Springer, Cham. Khouloud Salameh, Richard Chbeir, Haritza Camblong, Gilbert Tekli, Ionel Vechui, A generic ontology-based information model for better management of Microgrid, the 11th International Conference on Artificial Intelligence Applications and Innovations, AIAI 2015, pp. 451-466, Springer, 2015. Vanea Chiprianov, Laurent Gallon, Khouloud Salameh, Manuel Munier, Jamal El Hachem, Towards security software engineering the Smart Grid as a System of Systems, the 10th International Conference on System of Systems Engineering, SoSE 2015, pp. 77-82, IEEE, 2015. Khouloud Salameh, Joe Tekli, Richard Chbeir, SVG-to-RDF image Semantization, the 7th International Conference on Similarity Search and Applications, SISAP 2014, pp. 214–228 Springer, 2014.